Some observations about change and innovation from an authentic pioneer. I first wrote this piece on the birthday of one of the people who helped invent the modern computer: Grace Hopper was born in New York City in 1906. She began tinkering with machines when she was seven years old, dismantling several alarm clocks around the house to see how they worked. She studied math and physics in college, and eventually got a Ph.D. in mathematics from Yale (hardly a common event for women of that era). When the US entered World War II, Dr. Hopper wanted to serve her country. Her father had been an admiral in the Navy, so she applied to a division of the Navy called WAVES, which stood for Women Accepted for Voluntary Emergency Service. They turned her down at first, saying she was too old, at 35, and that she didn't weigh enough, at 105 pounds. But she wouldn't give up, and they eventually accepted her. With her math skills, she was assigned to work on a machine that might help calculate the trajectory of bombs and rockets. Dr. Hopper learned how to program that early computing machine, and wrote the first instruction manual for its use. And she went on to help write an early computer language known as COBOL — "Common Business-Oriented Language." 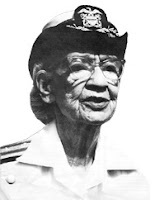 She remained in the Navy, and eventually became the first woman promoted to the rank of "rear admiral." In her work and her thinking she displayed an attitude that is relevant to those of us who teach and shape the learning process. Many medical faculty members who are engaged in curricular planning and educational decision-making seem to have adopted the belief that educational approaches that have been used for many years must have proven their worth and deserve to be perpetuated. The best shorthand response to that assumption was provided by Grace Hopper, who said (slightly edited by me): "The most dangerous phrase in any language is: But, we've always done it that way." Another quotation that has also been attributed to Grace Hopper, which is also relevant to innovators, especially in some organizations: "It's easier to ask forgiveness than it is to get permission." Also credited to her, in the domain of goals, purposes, and risk-taking, is the quote, "A ship in a harbor is safe, but that is not what a ship was built for." A small side story of possible interest: Admiral Hopper contributed a frequently used word and concept to our language. In the 1950's, working on one of the first EINIAC computers, she and her colleagues were stumped when it suddenly stopped working. After all regular diagnostic tests provided no help, she crawled inside this room-size computer, and deep in its innards found a moth that had died, short circuiting two connections. From then on, whenever anything went wrong with a computer, she referred to the problem as being a "bug" in the system. We should thank her, and maybe smile a little, the next time we find a use for her word. For more information on Grace Hopper, please see her Wikipedia page. NOTE: In the following discussion, I’ve focussed mostly on abstract generalities, not on the specifics of how to implement the recommended educational approaches, nor on examples of these approaches in action. I introduce the implementation theme in Part 3 of this curriculum series, and I will be offering more of the specifics and examples in subsequent postings. At least for a while, a new medical school provides an opportunity to pursue the dream of overcoming problems inherited from the past. We must begin by acknowledging that our legacy educational designs weren’t based on evidence from educational or brain research. They weren’t even based on careful or systematic reasoning. They grew out of the intuition and impulses of those in positions of leadership. Most often, those in positions of educational leadership gained their influence from prominence in domains only marginally related to the processes of medical education. Typically, those leaders were people who were admired for their clinical and/or research achievements, aided by their inclinations to publish their writings and to seek positions of prominence. Not all of their educational design decisions have proven to be inappropriate, but many have, as I summarized in Part 1 of this curriculum series. Some of our inherited curricular problems are especially serious and are long overdue for correction. commitments to, and approaches to, sustaining their own health. As you may have already recognized, the process of undertaking this comprehensive diagnostic phase brings the secondary, important educational benefit of helping the students gain a more refined sense of their own strengths and an enhanced awareness of the learning tasks that lie ahead. Aren't there some outcomes needed by all students? There certainly are some foundation outcomes we should expect of anyone who is to be considered worthy of graduating from medical school. But, those outcomes need to be conceptualized quite differently from the way they’re most commonly formulated now. Our characteristic approach to defining outcomes (if we think about them at all) has been in terms of "content,” in terms of the information that graduates are expected to possess and the procedures they are expected to be able to perform. Only recently have we begun to include some focus on outcomes in terms of the “processes” in which our students engage: the cognitive and emotional competencies new physicians are expected to develop. And, even as these “process outcomes” have begun to be pursued, the focus has been far more on the students' cognitive competencies (the ways they think and solve problems) than on their emotional and social competencies (the ways they understand themselves and others; the ways they detect and respond to emotional signals, the ways they communicate, and more). A central challenge we face in redesigning medical education is learning how to prepare graduates who can all be trusted to be constantly seeking to learn and improve throughout their careers. For that, they will need to be effective at continuously monitoring their current limits and learning needs. The issue isn’t what they know and can do medically at the time of graduation. The issue is ensuring that they will have what it takes to keep learning and changing. They will need to be continually evolving, acquiring what they need to know and need to be able to do as required by the particular circumstances that exist at any given time. We must stop thinking of “content competencies” as static. It isn’t safe to assume that a reasonable command of the content needed at one point in time predicts the level of content mastery a person will have at another point in time, when the circumstances will be quite different. Am I suggesting that what we know is unimportant? Definitely not. When learning to think and problem solve, we need something to be thinking about. Medical students' learning experiences, as they work to enhance their capabilities as thinkers and problem solvers, need to happen around medically relevant topics and issues. So, we must define those contexts that present the students with the sorts of challenges that require them to be continuously thinking and problem solving. But the information they acquire while engaging in these processes needs to be accepted as being a secondary consideration, not as primary, as it now often is. The information that will be relevant to the issues they will face in the future will likely be quite different from the information they use at this time. The information itself should not be seen as the central basis for our teaching or for our assessments of learning, as most typically happens now. highly refined and effective in their interpersonal relationships, whether with colleagues, subordinates, students, patients, or the general public. Attending to these obligations mustn’t be mere embellishments on a conventional curriculum. These must be central imperatives in all parts of the educational program. The curriculum needs to be sufficiently focused and consistent to ensure that all graduates are dependably competent in all these areas. These competencies must be seen as far more than the surface behavior that shrewd test-takers know to exhibit when they are being observed, but can relinquish when on their own, as is now found to happen with too many students in relation to some medical school goals during and following formal assessments. The six competencies listed above need to become core values that are “owned” by each learner and sustained throughout their careers. Too many medical curricula now fall far short as producers of this sort of graduate. Each medical school should be attending to the task of defining what they consider the minimally acceptable levels of accomplishment in each of these six areas, as a guide to their student-selection process. All schools, it seems to me, then have the task of helping all of their students grow as far as they can beyond the levels at which they began their medical education. Creating and sustaining such a program will require many changes from the currently dominant pattern in the world's medical schools. At the center of these changes will be our need for highly accomplished, deep-thinking educators as both the teachers and the administrators of our educational programs. I seek to clarify and expand on these and other requirements for creating and maintaining a thoroughly professional medical curriculum in subsequent parts of this series. * NOTE-1: As with all entries on this blog, your constructive critiques, recommendations and reflections are warmly encouraged. Please add your Comments below, or, to convey your reactions privately, please send an email to: hkj337@gmail.com. Many thanks. Might Apple Inc Revolutionize Education? Today (19 Jan. 2012), Apple Inc introduced three initiatives intended to "reinvent the textbook” and enhance learning. Did they live up to my dream of yesterday? No. Instead, they surpassed it! Highly dynamic, including audio, graphics, animations, and videos. Interactive, with adaptive questions and answers, changeable graphs and diagrams, and more. Customizable by students, with easy highlighting and note-making. Fully searchable, for words, phrases, highlights and notes. Enriched, with glossaries, study guides, and more. In addition to announcing agreements with major textbook publishers, Apple unveiled a new, free app that will make it relatively easy for teachers (and others, perhaps even students) to create dynamic, “modern” textbooks using iBooks Author, available now for free download at the Mac App Store. For accessing and using these new kinds of books, Apple also announced an update of their iBooks iPad app to iBooks 2. This app is also free, and also available now. Once installed or updated on you iPad, launch that app, click on the Store link in the upper-left corner, and you will see the promotions for the newly available textbooks. I suggest you consider downloading the free sample of the first two chapters of the E.O. Wilson Foundation’s new e-book, Life on Earth. It will give you a glimpse of this new category of “textbook”. To see Apple’s video on these and other initiatives, including public commitments to these new style textbooks by the CEOs of 2 textbook major publishers, click here . iTunes U app: Apple also introduced their enhanced iTunes U, with a dedicated app for accessing and using the resources offered there. As you likely know, many universities have been making some or all of their courses available online via iTunes U. The new iTunes U app lets teachers create and manage their courses, including components such as lectures, assignments, books, quizzes and syllabi, and offer them to iOS users (iPad, iPhone, iPod Touch users) anywhere. Some highly regarded universities, including Cambridge, Duke, Harvard, MIT, Oxford and Stanford have offered courses via iTunes U. As of today, elementary and high schools can also offer full courses through the iTunes U app. Learners anywhere can now take an entire course, with complete access to all course materials. Students are able to access their e-textbooks from within the iTunes U app, and any notes and highlights they add in these iBooks can be consolidated for review in one place. In addition to reading books, viewing presentations, lectures and assignment lists, registered students can receive notifications of the latest class information, can make appointments with their teachers and advisors, check class and school events, and more. 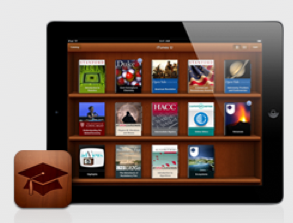 The iTunes U app is available today as a free download from the iTunes App Store. Educators are said to be able to quickly and easily create, manage and share their courses, quizzes and handouts through a web-based tool and utilize content and links from the iTunes U app, the Internet, the iBookstore, or the App Store as part of their curriculum. They can also upload and distribute their own documents such as Keynote, Pages, Numbers or books made with iBooks Author. How much of a breakthrough is all of this for future education? That remains to be seen. On first exposure, the tools made available today seem genuinely impressive, with considerable potential for helping move education into a more engaging, meaningful, participatory, and consequently more effective era for learners. But this potential won’t be realized without major transformations in the sensibilities, understandings, and skills of the teachers who need to adopt, learn, and implement these resources. The record of our species generally, and of teachers specifically, as constructive responders to new opportunities that require alterations of assumptions, mindsets, and attitudes is hardly encouraging. But, enough teachers may have already moved into the world of twenty-first century technology to have the comfort base that will help them welcome, rather than be intimidated by, these new tools and processes. I’ll be watching closely and hopefully (while experimenting a bit with these new tools myself). Tomorrow, 19 January 2012, Apple Inc will host a media event, at an exceptional venue for one of their closely-watched announcements. Almost all their announcements are held in generic auditoriums in the San Francisco region. Tomorrow's will be held at the Guggenheim Museum, in New York City. Mystery always surrounds these events. 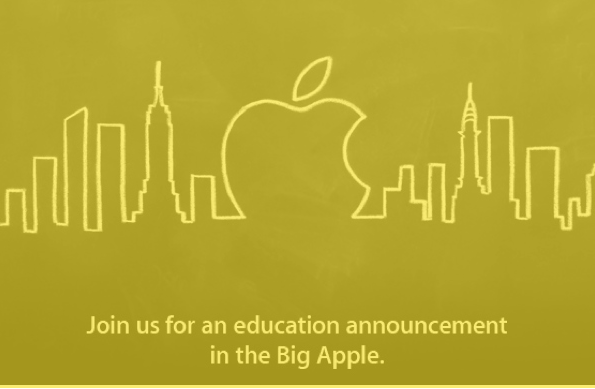 The invitation for this one says only: "Join us for an education announcement in the Big Apple." The company's cryptic advance communications about their events generate rumors, speculations and predictions. This time, several commentators have wondered if Apple will be bringing electronic textbooks (e-textbooks) to their mobile devices, especially the iPad. Some college students have been quoted as saying they prefer paper-based textbooks to the digital versions. They aren't clinging to their conventional textbooks out of love for their size, weight or tradition. They choose paper-based texts because they can be resold at the end of their course. Currently, e-textbooks can't be resold. I suspect that textbook publishers manipulate the economics of textbook sales as part of their devotion to preserving their established business model. My guess (dream) is that Apple will disrupt a whole industry again. This time it will be the textbook publishing industry (much as they've done to the computer industry, the music distribution industry, and others). They will announce a revolutionary model: they will start "renting" textbooks, not selling them. The student's cost for rental for the duration of their course will be a fraction of their cost for purchase. The students will be relieved of the hassle of reselling, and of carrying several heavy books around all day. They will no longer have to try keeping their textbooks clean to sustain their resell value. And the publishers and authors will get enough of a cut of every rental to keep them happy, because there will be many more of these books rented than were typically sold. Students on tight budgets will no longer have to struggle with depending on their library's small number of loaners, or on the awkward arrangement of sharing one book among several friends. Like most people, I have no inside knowledge. But, I'll be sorely disappointed if my predictions aren't at least partially correct, largely because electronically published textbooks can bring huge advantages over their dead-tree-based counterparts. They are FAR less expensive to produce, warehouse, and distribute; they can be revised on the fly, rather than every 10 years; and the current influence of extremist groups on textbook content, especially for the early years of education, will be nearly eliminated (except for their local school districts). And, of greatest importance, the students will have use of far more valuable texts. In addition to being more up-to-date, their e-texts will be highly searchable for words and phrases, and for each student’s own bookmarks and notes. These twenty-first century “textbooks” will become far more powerful educational resources than conventional textbooks ever were or ever could be. E-textbooks will eventually offer multi-media, interactive presentations. They will signal the arrival of a whole new era for the educational process itself. Teachers will eventually stop seeing themselves as conveyors of information. They will accept the research that has been confirming that the large-group lecture is an inadequate approach to teaching and learning. Instead, they will assign sections of these new "textbooks” as preparation for the highly participatory events that will replace traditional lectures. A functioning version of that future model can already be seen at the Khan Academy*: http://www.khanacademy.org. In the new model, I'm persuaded, these learning resources will be far more like an elaborate, highly focused web site than like our current image of a textbook. The notion of a publication date will become obsolete. There will only be version dates for sections within the "book". At some point, hopefully soon, these educational resources will be unrecognizable as "textbooks”. In my view, this is the way textbooks must evolve. A key question remains: how long will this transformation take? I don’t know, but here’s hoping this transformation begins in earnest very soon! Say, tomorrow. I can dream, can't I? * The Khan Academy is an important glimpse of aspects of the future. But, the fact that it is offering its resources free isn't a forecast that appropriately presented, interactive, e-textbooks can't be sources of revenue for authors, publishers, and others. This site and its resources are free because they've received substantial funding from the Bill & Melinda Gates Foundation. As you likely know, many breakthrough innovations first happen because of support from philanthropy or the government. The improving quality and expanding range of educational research. New neuroscience research techniques are providing fresh insights into how our brains learn. The arrival of "Web 2.0" (see below). Some medical education programs are taking steps toward recognizing and rewarding deserving educators. Colleagues and friends have encouraged me to have a regular outlet for sharing my reflections and ideas. My current career stage provides me with some of the considerable time needed for this project. A glimpse at the list of journals and other sources of information about medical education, many of which are available in the links in two sidebar widgets on the left of this screen (Related Journals/Info and Related Organizations), confirms that many encouraging developments are underway. There are growing numbers of people doing educational research in the health professions, and there is an impressive number of organizations focused partly or largely on efforts to enhance educational quality in our medical schools. Also, there are growing numbers of meetings and conferences focused on education in medicine and the other health professions. Have you seen Part 1 of my answer to this question? If not, you can go to it here. Throughout the 55+ years in which I've been a close observer of medical education I've seen the availability of information on ways to improve medical education move forward at a far faster rate than changes in the educational process itself. Although educational research has become increasingly sophisticated and more widely undertaken, resistance to revising established practices in medical education remains strong in many quarters. Those who try to initiate constructive changes are too often ignored and marginalized. Resistance to constructive change has many sources and takes many forms. Much is passive, not active, deriving more from indifference and ignorance than from overt rejection. Many teachers choose, or are forced by lack of awareness of alternatives, to rely on patterns similar to those they experienced as learners. As I've tried to point out elsewhere, we are doing far better with our "macro" decision-making (our organizational planning) than with our "micro" decision-making (decisions that are needed during moment-to-moment, teacher-to-learner transactions). Our overall planning strategies have evolved fairly steadily, but our day-to-day encounters between teachers and students remain largely in the hands of people who are not sufficiently prepared for the demands of the tasks we depend on them to pursue. Too much front-line teaching has not changed significantly from a half-century ago. Why does change come so slowly? The references below are meant for anyone who has an interest in understanding aspects of the teaching-learning process from a broader perspective than is usually available from the occasional education-oriented article appearing in the clinical or biological research literature they may routinely peruse, or even from intermittent scanning of the medical education literature. Each reference below offers some consolidation of findings and perspectives from multiple sources. I offer them hoping that you will find they provide you with a broader and deeper appreciation for the complex, fascinating process of human learning than may be available from more conventional sources. Several of these references are books that were written for the general public, not for health professions educators. I'm persuaded that they can be helpful to people who are serious about being effective educators and who appreciate good writing that is meant for a broadly educated, non-specialized audience. I hope you find some fresh ideas and new directions here. I will supplement and refine this list from time to time, and I will add brief, specific commentaries as my time permits. Donovan MS, Bransford JD, Pellegrino JW. How People Learn: Bridging Research and Practice. Washington, DC: National Academies, 2000. Gardner H. Intelligence Reframed: Multiple Intelligences for the 21st Century. New York: Basic Books, 2000. Gardner H. Changing Minds: the Art and Science of Changing Our Own and Other People’s Minds. Boston, MA: Harvard Business School Press, 2004. Gawande, A. Better: A Surgeon's Notes on Performance. Picador. 2008. Gigerenzer G. Gut Feelings: The Intelligence of the Unconscious. Viking Adult, 2007. Goleman D. Emotional Intelligence: Why It Can Matter More Than IQ (10th anniversary ed.). New York: Bantam, 2005. Goleman D. Social Intelligence: the New Science of Human Relationships. New York: Bantam, 2006. Marchese TJ. New Horizons for Learning. The New Conversations About Learning: Insights From Neuroscience and Anthropology, Cognitive Science and Workplace Studies (available online). [Oct 2007]. MacDonald M. Your Brain: The Missing Manual. Pogue Press, 2008. Montgomery K. How doctors think. New York: Oxford University Press, 2006. Schacter DL. How the Mind Forgets and Remembers: the Seven Sins of Memory. London: Souvenir, 2003. Squire LR, Kandel ER. Memory: From Mind to Molecules. New York: Owl Books, 2000. Stern DT. Measuring Medical Professionalism. Oxford University Press, USA, 2005. Vella J. Learning to Listen, Learning to Teach: the Power of Dialogue in Educating Adults. San Fransisco, CA: Jossey-Bass, 2002. Weimer M. Learner-Centered Teaching: Five Key Changes to Practice. San Fransisco, CA: Jossey-Bass, 2002. I invite your comments on any of the entries above, and please share your suggestions of other references that should be added to this list. Some tips for getting around and finding items of interest. Like most blogs, this site consists mainly of postings. Each item (essay) that is added in the main window is a "post." Each one is identified with the date it was added or most recently updated, with the newest post placed at the top of the stack. You, and all visitors, are encouraged to contribute "comments" on the posts and on other people's comments. At the top-right corner of each post is an indication of the number of comments related to that post that have been added, and a hot link that takes you to those comments, if there are any. That same link takes you to a window where you can add your comment. In addition, at the bottom of each page there is a pencil icon that also links to the page where you can add your comments. For more about adding your comments, please click here. At the top of the main window is the Header Bar, a horizontal bar holding links that give you access to specific information, such as the post you are now reading. Those hot links are available to you at all times, at the top of every page you visit in the main window. On your left of the main window, in the "Sidebar," are resources that remain available no matter which posts you are reviewing (whichever page you are on). For more about the sidebar, please see below. Most of what you might want to do while visiting this blog can be done in more than one way, as I explain below. There are several ways to search for information. To search for a specific word, phrase, or person's name, take 2 quick steps: 1) Type the word(s) into the Search Box that is available in the top-right corner of every page and then press the Enter key on your keyboard. That will bring you one page that includes all postings that contain the word or phrase you requested. 2) Now do a conventional "Find". That is, on a Mac, type Apple (Cmd)-F. On a Windows PC, type Control (Ctl)-F. In each case you will find that your chosen word or phrase is highlighted on screen and you can scroll down to quickly locate each instance of the word(s) you are seeking. Categories (Topics): Each post is assigned one or more categories. That is, each post is focused on one or more of the topics in the list offered by this widget. If you are interested in a specific topic area (say, teaching), this is probably the best place to look first. You will see how many entries relate to your interest. Clicking on the category name will bring you a single page with all the posts that meet your request. They will be available in the main window, enabling you to scroll among them, in reverse chronological order (i.e., the newest one is at the top). Recent Posts: If you are a regular visitor and want to quickly see which five postings have been added most recently, this is the place to look. Recent Comments: Similarly, when returning to this site, this widget will enable you to quickly check if any comments have been added by others since your last visit. Archives: This widget presents you with a list of the dates of all postings, working forward in time (the reverse of the way in which the posts themselves are sequenced). You can look here to quickly return to a posting you had previously read, as long as you know the approximate date of that prior visit. Or you can look here to see if there were postings in the past of possible interest to you that you may have missed. Visitor Locations: This widget provides a quick glimpse of the regions of the world where the visitors to this blog are based. In addition, the sizes of the red dots provide a very rough approximation of the numbers of visitors we've had from each general location. Clicking on this map takes you to the home site of this resource where you can see a larger-scale version of the world map and its dots, enabling you to get a better sense of the information it provides. In addition, once you are at the larger map, you can click on any continent to get more detailed information on the locations of our visitors. Note: We never collect (and have no way of collecting) any personal information about those who visit this site. The map is offered only to provide a sense of the geographical diversity of those who have visited this site. A Little About Me: Since I am the creator and chief contributor of entries in this blog, I've assumed that some visitors, especially those who don't know me, might appreciate a little information about my background. The information in this widget offers a brief summary of my professional experiences, which may help you decide if you want to pay attention to what I say. At the end of that entry are links that can take you to more detailed background information about me and my career. Ultimately, I hope you will consider the quality of my ideas and suggestions on their own merits, but I'm fully aware that we have a long academic tradition of tending to pay more attention to the source than to the force of arguments. I certainly understand that you may want access to this added information about me. After you've made one or more visits to this blog, and you've learned enough to navigate and search successfully, you may want to come straight to the latest postings on subsequent visits, bypassing the Home Page that comes first when you use the site's primary URL (rethinkmeded.org). To do that, bookmark and use the site's secondary URL: http://rethinkmeded.blogspot.com. TIP-3: Interested in our "logo" image? As you likely recognize, the image we selected to represent this site, to the left of our blog's title in the header, is Auguste Rodin's celebrated sculpture, The Thinker, dated 1902. If you would like to learn more about this wonderful creation, just click on the image itself. It is a hot link to the Wikipedia page about The Thinker. I took the photograph we are using. Do we learn these lessons from being teachers? Do we learn worthy lessons from being teachers? The writer (who is not someone I know), proposes several lessons that can be learned from being a teacher, suggesting that they are relevant preparation for a potential senior politician, and presumably others who take on major responsibilities. What do you think? Two comments about President-elect Barack Obama predominate at the moment: He organized a stunningly successful presidential campaign, one without precedent; and concern about whether he can handle the diverse problems pressing on him now. People who raise these issues neglect one aspect of Mr. Obama's resume: He was a teacher for 12 years, teaching constitutional law at the University of Chicago. Mr. Obama honed his organizational, prioritizing and communication skills in the classroom. Like good teachers everywhere, he can organize a diverse amount of material into cohesive units; he can prioritize, deciding what is and is not necessary to learn at the moment; he can explain complex systems in an easily understood manner; he can anticipate and answer questions; he can remain calm in chaos; he can handle the competing needs of individuals and groups; he can think on his feet and react quickly to diverse situations; and he understands the need to keep learning. The most important successful teacher characteristic he embodies is that he knows how to be in the midst of the activity without having to be the center of attention. Mr. Obama knows that he is not as important as the message he delivers and the ways he implements that message. Clearly the politicians, the pundits and the press who question Mr. Obama's abilities never have taught. That is a shame. Being an experienced teacher provides the best credentials possible to those seeking jobs in the public sector. Do you agree that teachers have or routinely learn the characteristics and skills suggested by the writer? If you are a teacher, do you have these characteristics and skills? Do you consider these characteristics and skills worth trying to develop if they haven't evolved on their own from the experience of being a teacher? Would you modify or reject any of these characteristics and skills? Why? Are there other characteristics and skills you propose are also part of being a successful teacher? If so, what are they? * I'm indebted to Roger Oliver for bringing this letter to my attention.